One thing that I like to do before getting a new motherboard is to read reviews. However, most reviewers only run the board for a few hours or days, cover the basics and then give their verdict. They never seem to encounter issues with software or niggles with hardware or, if they do, they don’t mention them. I don’t want to do that with this article and hope to give a better picture of the day-to-day running of the GA-Z97X-UD5H which I am going to use as my main PC. I didn’t jump on the Z87 bandwagon when it first rolled out as I felt my existing i5 2500k Sandy Bridge CPU and Z77 motherboard were doing a good job. Also I couldn’t really afford to upgrade and this is a situation that faces many of us. So I waited but, a few months ago I got hold of an i7 Haswell CPU and to use it, I needed a new motherboard. This was around the time that early hints of the upcoming Z97 chipsets and new motherboards were being posted on-line and a decision was made to wait until the new motherboards came along rather than to buy a Z87 based motherboard. As I stated before, cost is an issue with this build and I didn’t want to throw lots of money on new components, so I have recycled parts from my previous system to get this new build up and running. This is something that a lot of home PC builders do and is probably why we seem to encounter more issues than if we were building from scratch. So, what’s being used in this new PC? CPU: Intel i7-4770K Haswell - New - The CPU is being cooled by a water cooling loop, which really helps to keep the temperatures down. Other Used Items: Axiom 49 Midi Keyboard, Roland Duo Capture EX, USB3 HDD Dock, various USB pendrives. 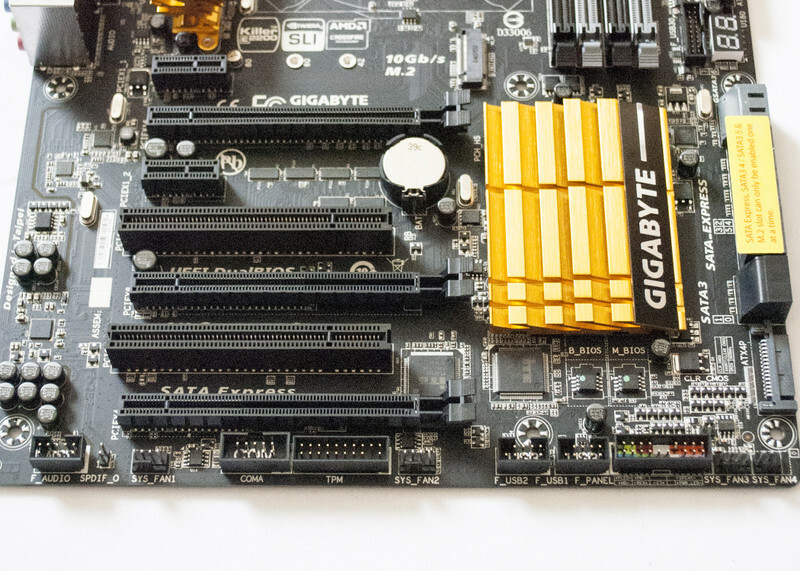 The GA-Z97X-UD5H motherboard is a stunning piece of equipment to look at and too hold. It feels solid and although the Gold heatsinks will not be to everyone’s taste, they are not as yellow as the publicity pictures make out. A question I have often been asked is: “What’s under the heatsinks and can they be easily removed?”. 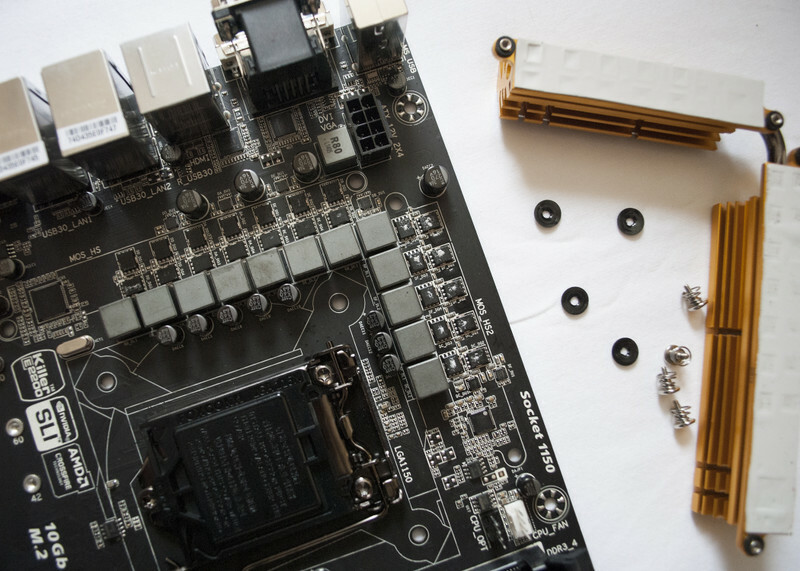 On this motherboard, the answer to that is yes, they can easily be removed, as each of the heatsinks are held on by two screws from the back of the motherboard. whilst the two heatsinks covering the PWM area are linked by a pipe and have strips of thermal pads. The Audio area of the motherboard is separated on the PCB layer and is marked out by a line on the motherboard. This is not as noticeable as the publicity shots make out but can still be seen. Apart from the CPU Fan Header, next to the CPU Socket there is also a CPU_Opt fan header, which will prove useful to some users that have a 3rd party cooler using two fans or a water cooled option that needs the Fan and Pump connected. Now to my first gripe, all of the other fan headers are laid out along the bottom of the motherboard. Whilst this might have seemed a good idea on paper, in practice it can make things very difficult when it comes to connecting things up, especially if your fans do not have long cables. My PC Case is a massive Xigmatek box and none of the fans mounted in the top of the chassis can be connected directly to the headers. 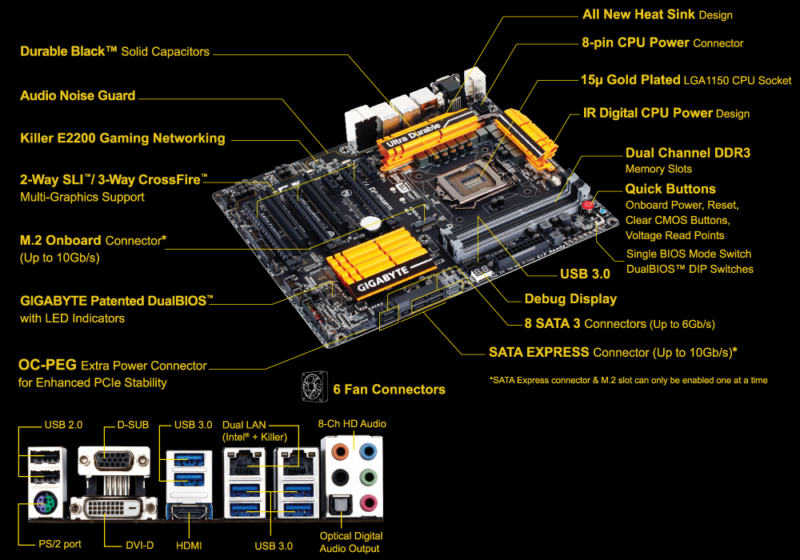 Not a big issue for me but for some users it will be and is worth thinking about if you are planning a build with this motherboard in a large tower case. There is an On-Board power switch along with reset and clear CMOS buttons. For everyday use these will never be touched but, if you are into overclocking they will prove invaluable, especially if you are running the motherboard on a test bench. Whilst on the subject of overclocking, another great feature of this motherboard are the two BIOS switches which can be used to manually switch between the BIOS chips. A real godsend if you are tweaking away and things go wrong. 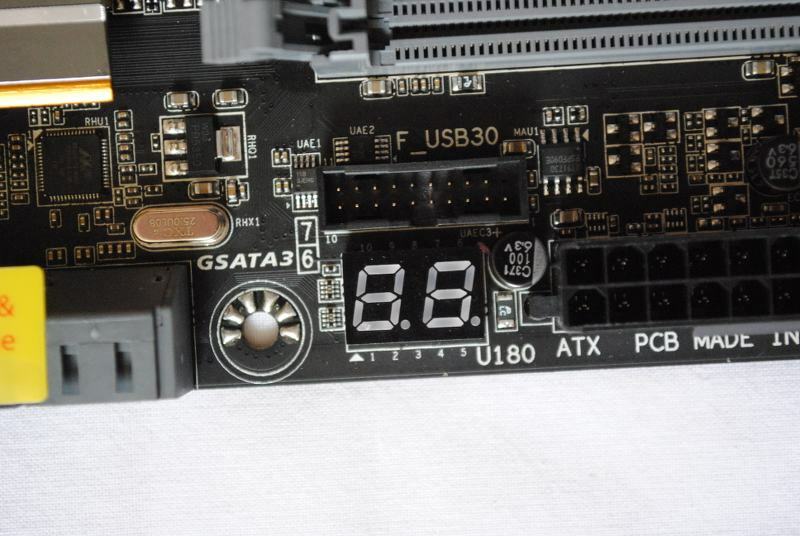 Also for those into their overclocking, there are several points on the motherboard where you can check system voltages, using a voltmeter. This is another really helpful feature and saves having to jump into BIOS or software programs to get these readings and being read directly from the motherboard they will be very accurate. There is also an LED Debug to help overcome some of those troublesome errors that can occur with any system. 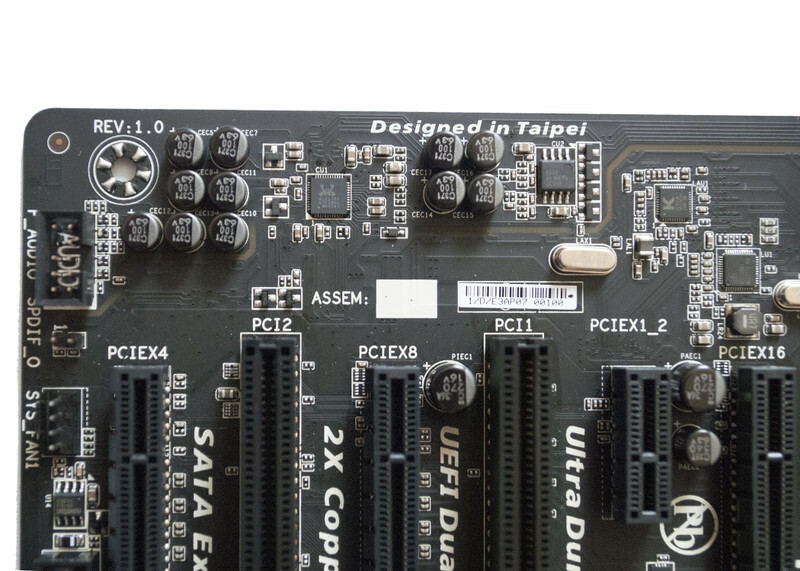 The Z97 chipset introduces us to a new option for SATA Connectivity, SATA Express and the GA-Z97X-UD5H offers both a SATA Express connector and also an M.2 SATA express slot. This new protocol provides for faster transfer speeds than the current SATA3 6 Gb/s and new devices are becoming available to make the most of this feature. 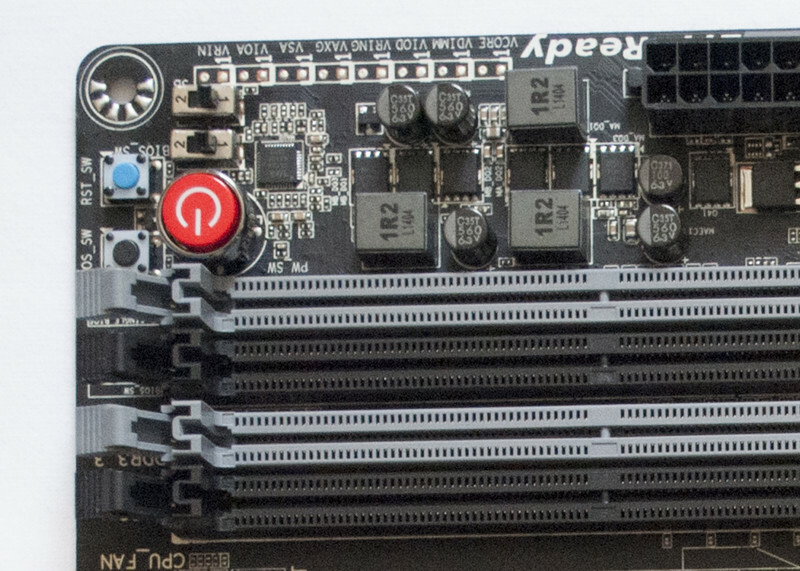 Along with the new SATA Express connections there are also eight SATA ports, six of which are Intel and two from the Marvell 88SE9172 Chip. 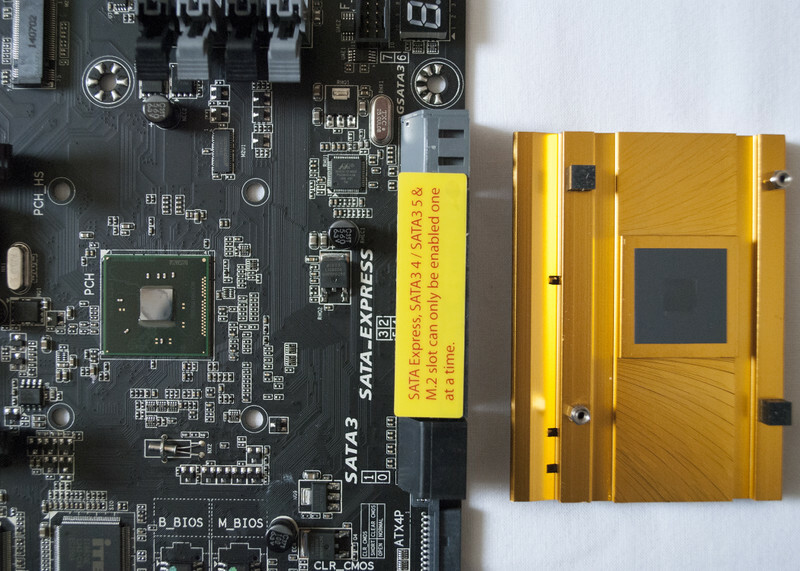 However, due to chipset limitations, if you connect a SATA Express device you lose the use of two of the Intel SATA ports (if I have understood things correctly) and this is something to seriously think about if you are planning on using a lot of SSD’s and/or HDD’s in your build. For most users this will not be a problem but to a minority it may be. For network connection there are two LAN ports on the back plate one powered by Intel the other is the Qualcomm Atheros Killer E2201. These cannot be teamed (linked) so don’t try. 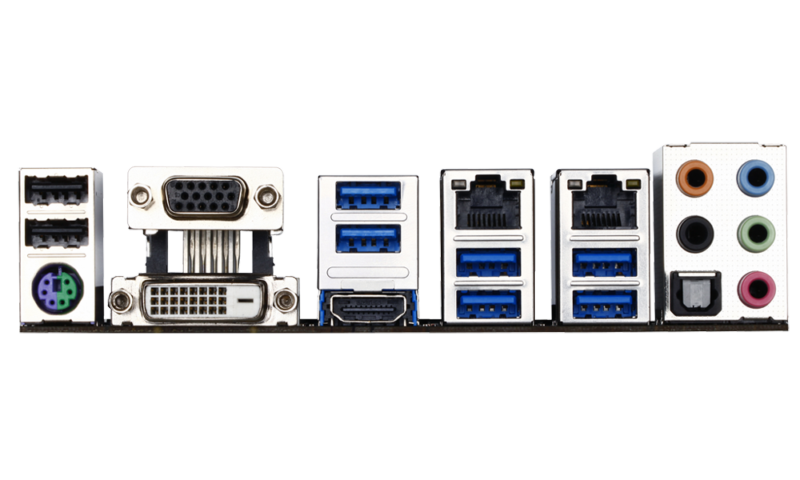 There is the usual plethora of USB ports and headers on the motherboard and there should be more than enough to cover most users’ needs. 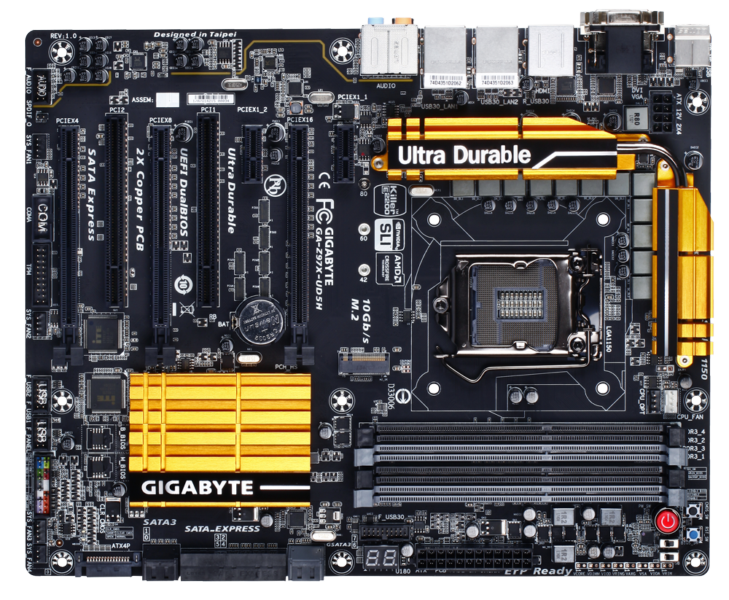 For more information on the GA-Z97X-UD5H motherboard check out the Gigabyte Microsite here: http://www.gigabyte.com/products/product-page.aspx?pid=4950#ov it goes into more detail on specific items and probably covers things better than I can. OK, enough of the overview, what you probably want to know is, just how good is the GA-Z97X-UD5H, when it comes to actually using it. That’s what I am hoping to cover in the next part of this review. The GA-Z97X-UD5H uses the AMI UEFI BIOS. 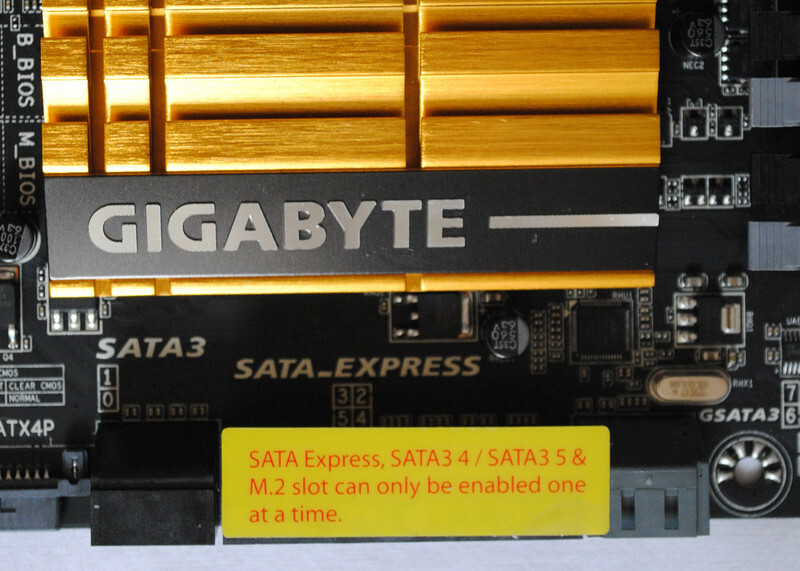 It has two 128 Mbit BIOS chips which can be individually operated via the switches on the motherboard. This is a great feature and it allows you to have different BIOS versions in each chip and to swap between them when overclocking or trying to find the optimum system settings. I am using the F8b Beta BIOS at the time of preparing this review. Flashing the BIOS is covered by the QFlash Utility which can be entered directly by pressing the End key on the keyboard during the POST process. 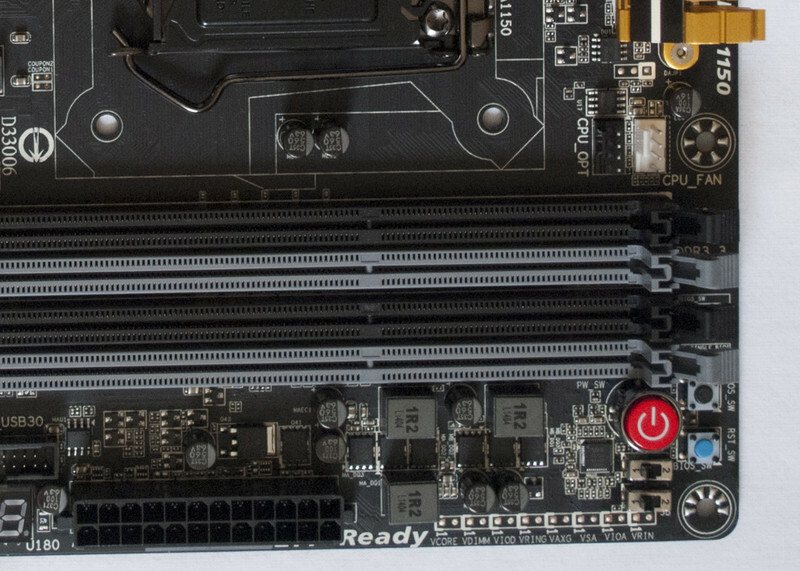 By using the BIOS switches on the motherboard you can flash each chip independently. Of course, if you want to synchronise the BIOS chips so they both have the same version then pressing the Alt & F10 keys during POST will automatically allow you to copy the Main BIOS to the Backup BIOS chip. When you first enter the BIOS you are presented with a simple screen that has a square panel divided into nine sections. making it easier for first time users and those not so comfortable with tweaking BIOS to make changes. 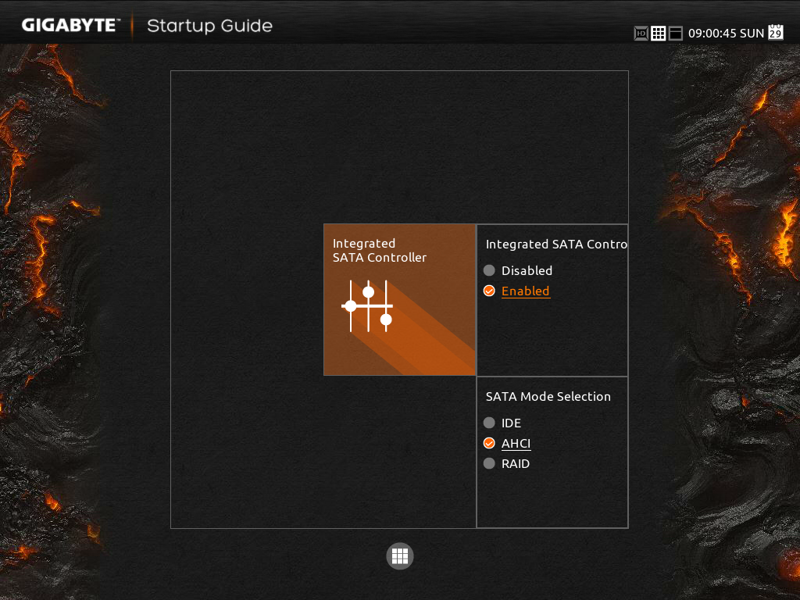 This is called the Startup Guide and is the default setting upon entering BIOS. When you look at the Startup Guide you will notice two little oblong tags on either side. If you click on the left hand tag it will take you to the Smart Tweak Mode (ST Mode). This is a little different from the traditional UEFI Interface and offers the user sliders and buttons to make changes to the BIOS settings and is much more graphical in the way that it presents the options. Pressing F2 will bring up the Classic Setup that more frequent users of BIOS will recognise. Here changes are made either by clicking with the mouse or by using the keyboard. Getting BIOS settings right can be a real minefield and care should be taken when making any changes, especially if you are trying to overclock. The thing to remember is to make notes of the default settings and only change things in gradual increments, test that the system is still working OK then adjust a little more. A useful feature here is the Screen Capture option. You need a USB Pendrive that has been formatted as FAT16 or FAT32 plugged into a USB port. The, by pressing the F12 key you can save a screen image such as the ones I am using in this part of the review. The actual settings that you will make in BIOS are individual and therefore I am not going to go through step by step settings here. If you are planning on just using this motherboard for everyday use, with no overclocking, then loading the Optimized Defaults will do the job for you and allow you to get up and running with RAM, CPU and other main components running at default settings, ie RAM running at 1333 Mhz. 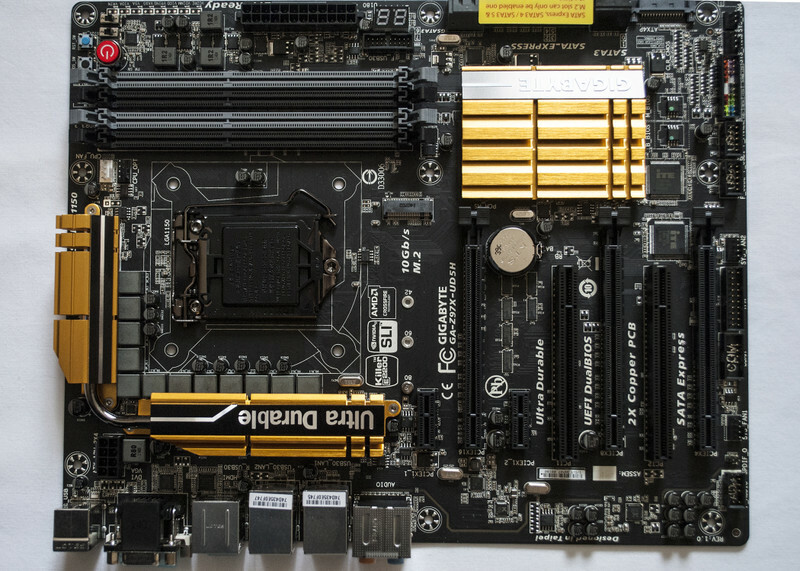 To get the best from this motherboard you will have to make some tweaks but that is the same with all motherboards and not unique to Gigabyte systems. A note of warning: If you enable Ultra Fast BOOT you will NOT be able to get back into BIOS easily and it should only be enabled once you have made all of the changes you want to and are happy that you will not be doing any further tweaks. If you need to get back into BIOS then the only way that I have found is to either clear CMOS, which of course removes all of the BIOS settings you may have made and resets to default or switch to the other BIOS chip using the on-board BIOS switch. Of course, both of these methods mean you will not have the last settings when you restart. All is not lost though, as it is possible to save BIOS settings as a profile and then reload the profile once you are back into BIOS, which can save a lot of time. The one big problem that I have and I’m sure many other users have too, is understanding what exactly all of the options do in BIOS and the User’s Manual is no help here either. The assumption is made that we all know exactly what XHCI Hand-off or Filter PLL level means and what they actually do. I know that Google is your friend and in a lot of instances doing some research will answer these questions but I feel that, when it comes to the BIOS, a rewrite of the book is needed with better descriptions and guidance for the user or a separate book dedicated to the BIOS with fuller information so that we poor idiots can learn more about what exactly we are tweaking and to do so with a better understanding of the terms and abbreviations being used and the possible consequences of the tweaks being made. Despite my grumble I have to say that overall, the AMI UEFI BIOS is pretty user friendly and the way Gigabyte have set things out, it is easy to navigate and get to grips with. The GA-Z97X-UD5H has so far been pretty forgiving when I have made errors and the simplicity of the on-board BIOS switches have proven to be a real time saver in getting my system up and running. While I am preparing this part, you might want to check out the Plextor M.2 PCIe SSD review I have posted here: http://forum.giga-byte.co.uk/index.php/topic,14710.msg90963.html#msg90963 This is an awesome piece of kit that utilizes the M.2 slot on the GA-Z97X-UD5H motherboard. OK, it has now been two months since I put my system together using the GA-Z97X-UD5H motherboard and unlike other reviewers, I am now prepared to pass a final verdict on this motherboard. So, what can I say about the PC, apart from the fact that I have not had any issues, except for those of my own making. One thing to note here, I do have an older OCZ Vertex 2 SSD which wasn’t recognised when I connected it to the system. This turned out to be an issue with the OCZ drive and not the motherboard and it seems as if the older OCZ drives use technology that is incompatible with Intel’s Z87 & Z97 chipsets. The OS installed onto the Plextor M.2 drive without a hitch and has been running faultlessly ever since. There have been a few negative reviews about this device but I have to say that on a personal level, I have not encountered any problems. In fact, this is the first build in over 12 years that still catches me out with the speed at which it BOOTS and the speed of everyday applications that I use such as Cubase, Photoshop etc. Transferring large files between drives and also via the USB3 ports is no longer a time eating factor. For example, a folder containing 16 Gb of video files can be transferred in under two minutes between SSD’s and under four minutes via USB3. Of course, this speed will vary depending on the kind of devices used and also on the type of files being transferred but, generally, I have to say that I have been very impressed by this usually mundane task. Enabling Ultra-Fast BOOT in the BIOS has bought the BOOT time down to around 10 seconds from cold. Of course, enabling the Ultra-Fast BOOT can cause problems if you wish to get into the BIOS but using the Recovery features within Windows 8 enables you to get into BIOS without a problem. If you are running a different OS, then this option may not be available to you, in which case, you will need to either switch the BIOS chip to the back-up one, or clear CMOS to get into BIOS. The supplied software apps, to my mind, are disappointing. I had hoped that Gigabyte would have improved their functionality since I last tried using any of these on my Z77 setup but sadly they are still far too gimmicky for my own personal taste. I uninstalled all of the Gigabyte software within a few days of installing it and I for one, do not miss it. 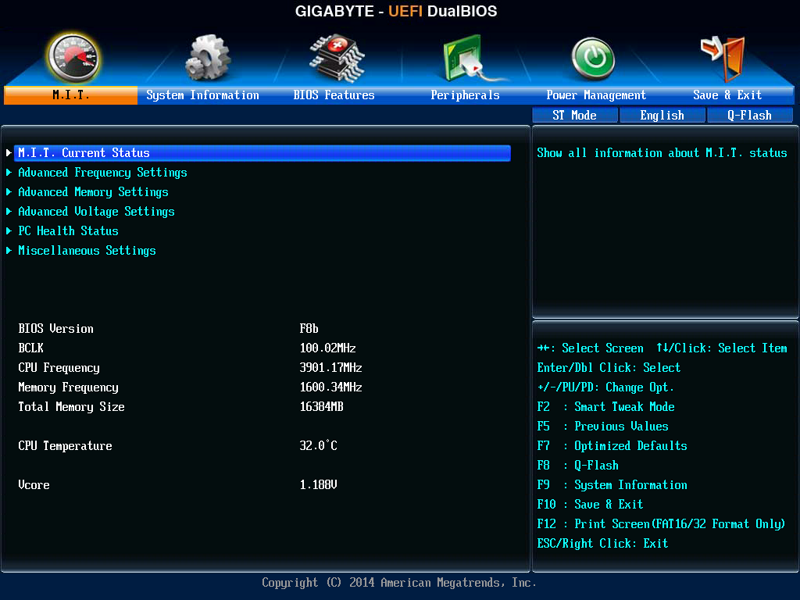 When it comes to overclocking there are pre-set options available in BIOS for the i7-4770k which I tried out. Whilst these generally worked and did produce the stated CPU clock speed, I think that the Voltages that are set are too high. I am water-cooling my CPU and it got hot enough on a couple of occasions, using these pre-set options to worry me, although the system did remain stable. 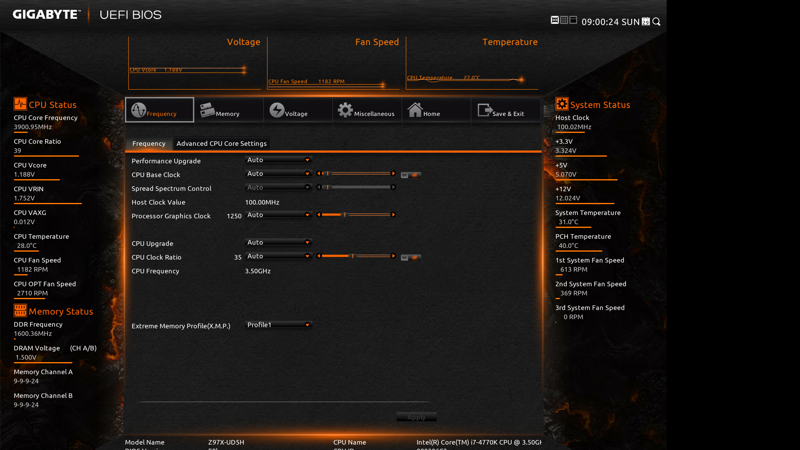 In the end I decided to make the necessary changes in BIOS myself and have settled on a CPU speed of 4.3 GHz @ 1.210V. This is giving me idle temperatures of approx. 34C and max temps of approx. 58C when the system is fully loaded. This is only about 2C hotter than when I had the system set to defaults with the Turbo Speed being only 3.9Ghz. The other on-board devices, such as audio and LAN have worked perfectly and neither have given any problems. The same can be said for all of the USB devices I have attached, they have all been recognised and have worked as I have expected them to. When I built my first PC it was because some numpty in a shop, had sold me an expensive piece of hardware that didn’t do what I had hoped it would. Now, some 12 years later I have built a PC using the GA-Z97X-UD5H that I have to see has beaten my expectations. From the ease of installation of hardware and software through to over-clocking this board has been brilliant. There are so many features in BIOS that I could probably write a book, just about what they all are and what they do. But, and here’s the nice bit, they can be as easy or as complicated to change as you want them to be. Yes, the pre-sets work and for the most part will be more than adequate but, if like me, you are fussy and want to hit the sweet spot of increased speed and reasonable temperatures then you can tweak things to your heart’s content. If you want to get really pedantic, then the voltage reading points on the motherboard give you the option to confirm the readings that you are getting in BIOS. If you make a mistake and things don’t work as you have expected, then the BIOS goes into recovery mode, will shut down and reboot a couple of times before settling back into the system defaults, allowing you to start again. The BIOS switches which allow you to swap between BIOSES are another excellent feature that I have made plenty of use of and it’s great to have one BIOS chip set for over clocking and the other for day-to-day use, if you so desire. I know that Microsoft Windows 8 & 8.1 aren’t everyone’s cup of tea but hey, people complained about Vista and Windows 7 too. All I can say is that Windows 8.1, on this motherboard and with my chosen hardware works. I have had no blue screen issues and the whole system just rocks. If you are looking for a good, all round motherboard for your new build, then I can only say stop looking, for this is the one that you really want to be getting.